Engineers at the Marshall Space Flight Center in Texas have been busy putting together a prototype of a deep space station, which has been essentially assembled using scrap parts from the ISS. This has the added benefit of cutting down on costs significantly. Also, the ISS is a proven design. The Deep Space Habitat project is an attempt to work out the optimum size of capsule, equipment and resources to send outside of the Earth-Moon system. This could be sent to Mars, an asteroid or one of the Lagrange points in the Solar System. The mission is still at an early stage, sorting out the absolute necessities like food storage and life support. Other components like 3D printers and greenhouses for growing food are under consideration to make the mission slightly more self-sustainable. The initial concept missions call for the structure to cope with a sixty-day journey into space, and another for a much longer escapade, at about 500 days. The engineers also need to figure out how the capsule would be serviced from Earth. The most important factor is to understand how human factors will affect a deep space mission. It’s important to make astronauts as comfortable as possible so that the mission will be a success. 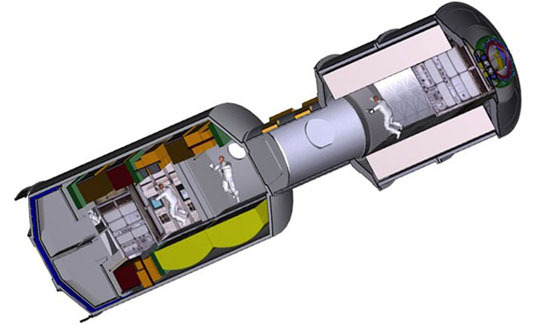 Be the first to comment on "NASA Designing Space Habitat from Spare ISS Parts"